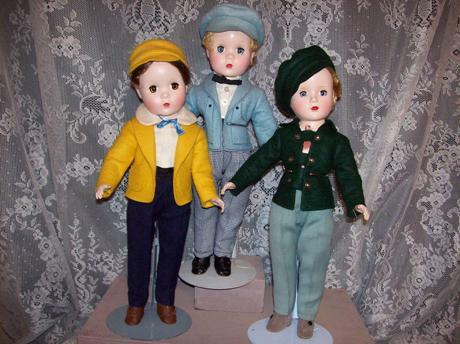 15” MADAME ALEXANDER’S LITTLE MEN, NATE, STUFFY AND TOMMY BANGS..
Beautiful S & H Oriental Bisque Character Doll. German socket head incised “S & H 1129 DEP 10” with Oriental tint, multi-stroked black eyebrows, slanted eye cuts, painted upper and lower eyelashes, open mouth with four upper teeth, chin dimple, pierced ears, original black mohair wig; original jointed composition body with original finish (stringing loose); red silk kimono, replaced shoes and stockings. A gorgeous one in a lovely large size! Condition (Excellent). Size 21" T.
12" (30 cm.) 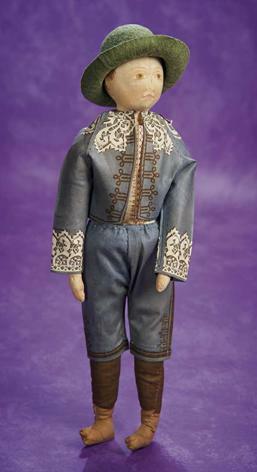 All-wooden doll with heart-shaped face and elongated throat, one-piece head and high-waisted shapely torso, dowel-jointing at shoulders, elbows, hips and knees, painted black hair with softly-swirled curls around the forehead, painted blue eyes, tiny mouth. Condition: original finish albeit extensive craquelure and tuck comb missing. Comments: Grodnertal, circa 1830. 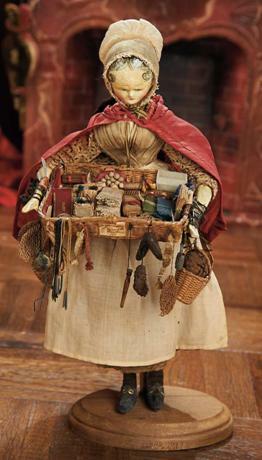 Value Points: beautifully-shaped head and shapely torso, the doll has original peddler's costume including gown, apron, cape and bonnet, and is holding a woven tray of tiny miniature novelties. 12" (30 cm.) 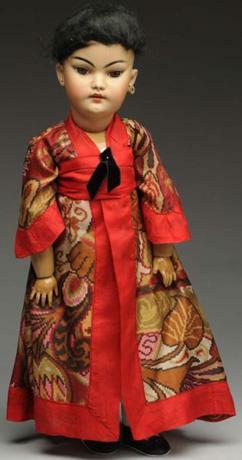 All-wooden doll with one-piece head and shapely high-waisted torso,dowel- jointing at shoulders,elbows,hips and knees,black painted hair with swirling curls around the face and sculpted yellow tuck comb at the crown,painted complexion and facial features,blue eyes,black upper eyeliner,closed mouth,ears pierced into head,painted red shoes. Condition: original finish albeit extensive craquelure on face of both dolls. Comments: Grodnertal,circa 1840. 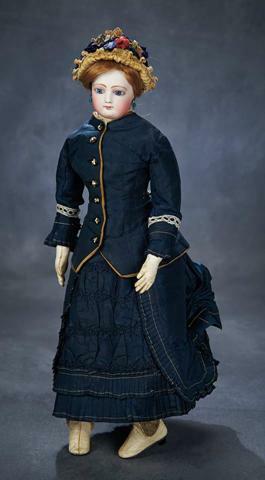 Value Points: good early doll with beautifully-shaped body and wearing early cotton costume,holding a miniature Grodnertal doll with jointed limbs and original costume. 15" (38 cm.) 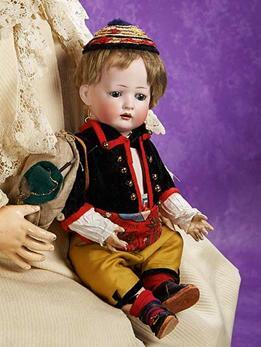 Of fine cotton,the doll has center-stitched face with slight dimensional detail of chin,painted brown short curly hair and facial features,brown eyes,outlined nose,downcast lips,on slender cotton body with painted brown stockings and tan shoes. Condition: generally excellent. Marks: Cocheco Manufacturing Company 1826...Lawrence & Co Patented Aug. 15th 1893 Number 503316. (attached cloth label). Comments: American,Lawrence & Co of Cocheco fabric mills of Dover,N.H. 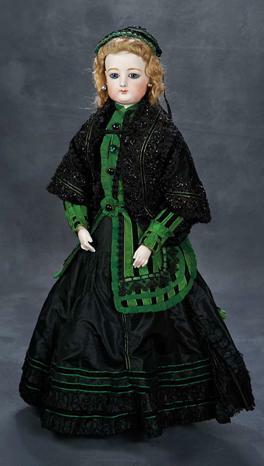 The important American fabric mill whose printed cotton fabrics were shipped world wide during the last quarter of the 19th century also created a novelty line of bolt-printed dolls and costume pieces,designed to be cut,sewn and assembled in the home; this is one rare example. Value Points: rarely found doll in wonderful state of preservation with original separately-sewn rare costume. 13" (33 cm.) Bisque socket head,small blue glass sleep eyes,painted long curly lashes,short feathered brows,accented nostrils and eye corners,open mouth,two porcelain upper teeth,brunette mohair wig,composition bent limb baby body. Condition: generally excellent.  Marks: K&W 1070. Comments: Konig and Warnecke,circa 1910. Value Points: rare-to-find model with expressive features,fine quality bisque,wearing wonderful antique costume. 26" (66 cm.) Bisque swivel head on kid-edged bisque shoulder plate,blue glass paperweight inset eyes,thick dark eyeliner,painted lashes,brush-stroked brows with feathered detail,accented eye corners,shaded nostrils,closed mouth with accented lips,pierced ears,blonde mohair wig over cork pate,padded stockinette over metal armature body allowing infinite possibilities,bisque lower legs,hands,bisque bare feet. Condition: generally excellent. Marks: 8 (head,shoulders and limbs) F.G. (shoulders). Comments: Gaultier,circa 1878,with unique body deposed by Pannier in 1872 and created by Gesland. Value Points: rare grand size with beautiful pale bisque,splendid eyes,exquisite sculpting of fingers and toes,and wearing very fine antique silk costume of black and green taffeta with black lace trim,and black beaded jacket,bonnet,undergarments,leather boots. 17" (43 cm.) Bisque swivel head on kid-edged bisque shoulder plate,blue glass enamel inset eyes with spiral-threading and darker blue outer rims,dark eyeliner,painted lashes,feathered brows,mauve-blushed eye shadow,accented nostrils,closed mouth with accented lips,ears pierced into head,brunette mohair wig over cork pate,kid poupee body with shapely waist,gusset-jointing at elbows,hips and knees,stitched and separated fingers. Condition: generally excellent,body very sturdy. Comments: circa 1870,attributed to Pierre-Francois Jumeau. Value Points: especially beautiful painting of complexion including very rare mauve-blushed eye shadow,beautifully-defined lips,wearing very fine antique navy blue taffeta fashion ensemble,undergarments,cream kidskin boots with Huret-like construction,fancy bonnet.